After working a few more variations, I completed this up and down buttonhole stitch sampler of this week. 15. the first row is the combination of up and down buttonhole stitch and cable stitch, in the second row, French knots are worked in between the stitches. 16. in the first row, detached chain in two shades are worked between the stitches and in the second row, detached fly stitches are worked between the stitches. First row, this stitch is worked with herringbone stitch. The second row, a variation of Cretan stitch and up and down buttonhole stitch are worked together. In the third row, bugle beads are added and in the fourth row, pearl beads are added to a row of this stitch. I enjoyed working these variations, though while detailing, the name of the stitch was too long for me use it repeatedly! 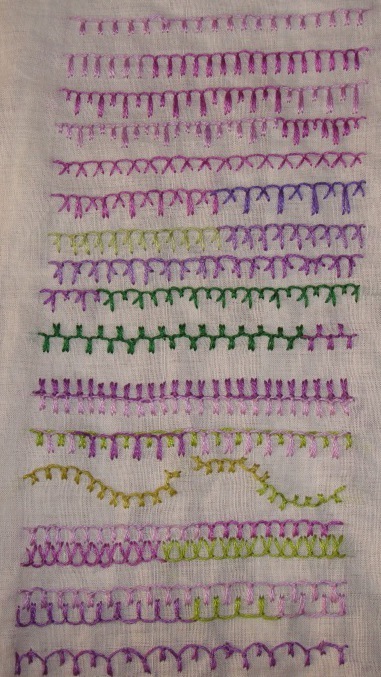 The details of up and down buttonhole stitch sampler, which I am working for the TAST 2012 stitch challenge. the second row, instead of going up once and down once for the stitch, I went up once and down twice, to get this three stitch version. 11.The three stitches version of the stitch worked with the basic stitch in this row. 12.up and down buttonhole stitch worked on various shapes. 13. The stitch is whipped with pearl cotton, in the first row. The next row is the combination of basic buttonhole stitch with this stitch. 14. the first row is the combination of closed buttonhole stitch with this stitch, in the second row, individual up and down buttonhole stitches worked between half buttonhole wheels. 4. the first stitch is shorter than the second stitch in the first row, this long and short version, alternated in the second row. 5.in this row, the long and short version of this stitch is worked with the basic up and down buttonhole stitch. 6. the stitches are worked both sides of the line in the first row, two rows of this stitch are worked facing away from each other in the scond row. 7. one row of up and down buttonhole stitch is worked over another row of this stitch in the first row. then the stitch is worked on curved lines. 8. in these rows, two versions of up and down buttonhole stitches are worked facing each other. 9.the zigzag version of this stitch is worked in this row. 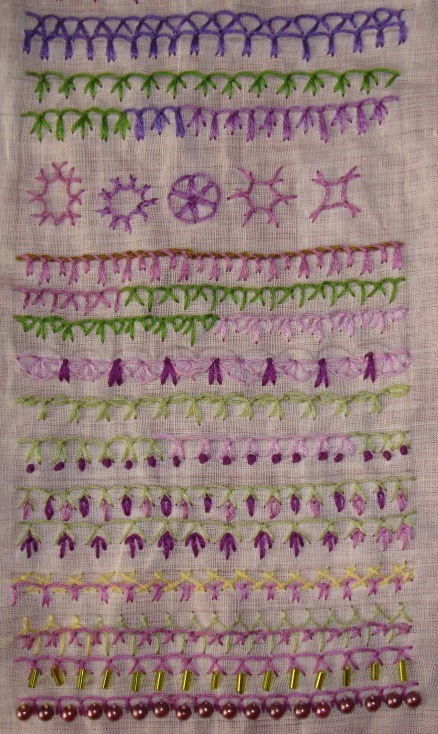 This week’s stitch on TAST 2012 stitch challenge by SharonB is up and down buttonhole stitch. I had not done this stitch on the previous TAST challenge, starting late on that challenge. It is a good thing for me that, this stitch is part of the present challenge. 1.I started with the basic up and down buttonhole stitch in the first row, the second row is the longer version of the stitch. 2. Alternating between long and short version of the stitch in the first row, the same stitch worked in varying heights. 3. in this row, the up and down buttonhole stitches are worked at a angle. The second row is the combination of the basic stitch with the angled version.